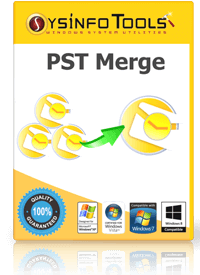 SysInfoTools PST Merge is a tool that combine multiple PST files into a single PST file, merge Outlook personal folders data, copy or move the content from multiple Microsoft Outlook PST files into a selected Outlook file or create a new PST file. Work for PST Merge Tool? Learning about PST Merge Tool? "PST Merge Tool: the best choice for always keeping your outlook info integrated"
- Allow combining multiple Outlook data files with Emails, Contacts, Calendar, Task etc. - Eliminates Duplicate items and excludes Deleted items making the merging process very reliable. - Compatible with 32 and 64 bits MS Outlook version, even with MS Outlook 2016. Also compatible with Windows 98, NT, 2000, Server 2003, 2008, Windows 7, Windows 8, and Windows 10. - Allows apply password security to the resultant merged file. - Provides 3 excellent ways for merging pst: Join PST Files, Merge PST Files and Merge Contacts. The installation process sometimes fails because of redemption.dll file problems during registration. It tool is very useful in order to support the laptop o pc maintenaince very reliable, and providing us with the wonderful option of merge the actual and historical pst information. In this way the decision making and business continuity can keep safe. * We monitor all PST Merge Tool reviews to prevent fraudulent reviews and keep review quality high. We do not post reviews by company employees or direct competitors. Validated reviews require the user to submit a screenshot of the product containing their user ID, in order to verify a user is an actual user of the product. Hi there! Are you looking to implement a solution like PST Merge Tool?